The LF3 is a programmable EDC light featuring a SSC P4 LED using a single C123 battery. The light is turned on and off with a twisty mechanism, there are two positions marked P1 and P2 that are used for different levels and for programming. Going from P1 to P2 and back to P1 or P2-P1-P2 produces a "switch" the number of times you "switch" selects the mode of operation. The LF3 has two programmable brightness settings and one variable brightness mode, since the variable brightness mode has memory we can say it has 3 brightness levels. It also has two programmable strobes, two programmable SOS modes, battery level indication and battery discharge protection. Operation and programming is identical to the LF2 we have previously reviewed. It can use primary or rechargeable 123 batteries without any problem, the light is regulated so once set to a level it will keep at that level regardless of the battery status. Runtime is about 40 minutes at 100% brightness and more than 7 hours at 25% brightness. The beam is excellent with a good compromise between throw and flood, the brightness at 100% using a rechargeable battery is really amazing, probably around 150 lumen. Since all the levels can be programmed you can set a low mode as low as you want and use it for reading or navigating the house at night. The LF3 is built in HA-III aluminum, it is very strong and will resist drops and impacts, it doesn't have a pocket clip but can be attached to a lanyard or splitring, it comes with a diffusser and red, amber and blue filters. The LF3 is a solid EDC light, it is very bright, offers several modes of operation and is completely programmable, the quality is excellent and for the ones that like a programmable versatile light this one is really superb. Also available for CR2 batteries (LF4) or for AA batteries (LF5). You can order from Liteflux via CPF for $52. The Starling is the smallest folding knife from Spyderco's child brand Byrd. The total length of the Starling is 4 3/8 (111 mm) with a blade of 1 15/16'' (49 mm) . Total weight is .65 oz (15 gr). A very small and very light knife. 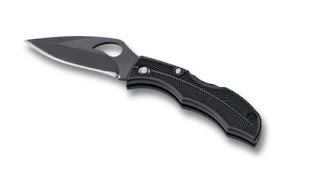 The blade is made of 8Cr13MoV steel coated in black carbonitride. The blade is sharp from the factory and is easy to resharp, edge retention is quite good unless you decide to use your keychain knife to chop wood. The blade features byrd thumbholes for one hand opening, they work great and even better if you have small hands. The handles are made of reinforced fibergalss (FRN) and are textured, there is also texturing in the spine and the thumbhole making the grip and the operation of the Starling surprinsingly good for its size. The lock is a backlock mechanism at the middle of the handle, it is very strong and works really well. A ballchain threaded thru the lanyard hole is included to attach the knife to a keychain, purse or to use it as a zipper pull. The size and weight makes it a pleasure to carry and the performance is really good making the Starling a very nice keychain knife with a very affordable price. You can read more or order from Spyderco for about $16. 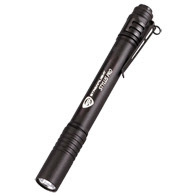 The Stylus Pro is the new upgraded version of the popular Stylus penlight by Streamlight. The changes are big, the light uses a new LED and AAA batteries now. 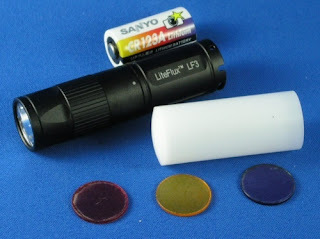 The Stylus pro uses a 0.5 watt LED powered by two AAA batteries, the output of the LED goes thru an optics system called "MOS" for Micro-Optical-System ending in a polycarbonate lens. The total output goes up to 24 lumen with a runtime of 7.5 hours. The switch is a forward clickie at the back of the pen, push lightly for momentary activation or push more to click it for constant on. It works very well with a good tactile response. The tailcap can be unscrewed to lock the light preventing accidental activation. The body is made of grade II anodized aluminum, it is shockproof and waterproof using orings to seal it. The pocket clip is long and very strong and will work fine in any kind of pocket. 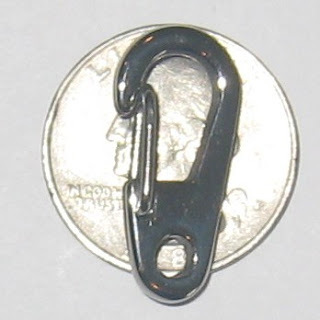 The clip also features a small hole to attach a lanyard or a splitring. Lanyard is not included. The total length is 5.3''. The beam offers a strong hotspot with plenty of sidespill, it is probably good as a general illumination tool and will be a big improvement compared with the old version. Compared to the old stylus the pro version is bulkier because it uses AAA batteries but it is also amazingly bright if compared and the runtime is really very good. If you are looking for a very slim penlight you should go with the original version, if the size of the pro is good to you then don't hesitate because the performance is really improved. You can order from LightHound for $19. This is an improved version of the Fenix P3D we have previously reviewed. The only difference is that the LED emitter has been upgraded to a LumiLeds Rebel 100 Led to make the light even brighter. The P3D has 2 modes of operation selected twisting the head of the light, in each mode you can cycle thru different levels and modes clicling the tailcap switch. In the first mode, you start in the lowest brightness level, then medium, then high and the SOS. In the second mode you start in turbo mode and the next level is the strobe. You can go to Turbo or Minimum from any mode just twisting or untwisting the head. We have previously commented we like this user interface a lot and we still do. With the new R100 LED the performance of the P3D is as follows: Minimum mode is 11 lumen with 65 hours of runtime, medium is 50 lumen with 13 hours of runtime, maximum is 112 lumen with 5 hours of runtime, turbo is 200 lumen with 1.8 hours of runtime. This figures using primary C123 batteries since rechargeables should not be used. In Turbo mode the P3DR100 is just amazing, the amount of light it produces will outperform probably any other light you have seen, unfortunately the light gets quite hot in Turbo mode so you should not use it for more than five to ten minutes in turbo to avoid damaging the LED or the batteries. Never leave the light in Turbo without holding it because your hand is the heatsink that disipates the heat from the body. The new Rebel LED is not only extremely bright but it also has a very white and warm tint that is certainly more pleasant to the eye than the tints we have seen in other LED lights. With the six levels of operation ranging from 11 lumen to 200 lumen and with runtimes reaching 65 hours the P3Dr100 is an excellent EDC light that is probably one of the best general purpose flashlights at the moment this review was written. You can order for $70 from Fenix-Store. The Dyno-Mite is a keychain crank activated light that uses no batteries and requires absolutely no power source to operate. To use the light you crank it using the lever on the side and after one minute of winding you get 5 minutes of light from the two 5mm Leds. 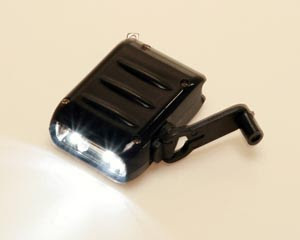 The light is of course not bright but is a perfect backup light and a very nice gadget to have in your keychain, specially considering that this is a light that will always work if needed. The Dyno-Mite is 1.6'' x 1.22'' x 0.6 '' (40 x 30 x 15 mm) and weights just 15 grams so it is perfect for a keychain, it has a small attachment hole for a splitring or a small lanyard. A keychain is included. Construction is solid and the internal parts are simple are well constructed so with normal use this light should last a long time. You can order for $7 from EssentialGear. Available in blue, red, green, silver, black and gray. We have previously reviewed the stainless steel clips as a very useful piece of hardware to attach your EDC items to a keyring, lanyard, carabiner and others. A titanium clip was very welcomed as a premium item in the same line of clips. The Ti clip is 26mm long, just 1mm longer than the SS "Micro" clip. It is built completely in titanium including the gate and the spring. The spring resistance is good enough to avoid accidental release but not hard to make it difficult to operate. Being made in titanium the clips are very strong and very light, they will not corrode even if used in a marine environment and they are also diamagnetic so won't be attracted to magnets and will not magnetize. If the size is good for you the quality of these clips is really excellent and will make your keychain perfect. You can order for $8.50 from Lighthound. 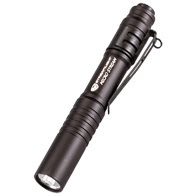 The MicroStream is a single cell penlight powered by a AAA battery. The light uses a 0.5watt high flux LED. The total length of the light is 3.5''. The Microstream uses a propietary optics system called "Micro Optical System" to focus the beam in a strong hotspot. The lens is made of polycarbonate. The body is made of grade II anodized aluminium, with orings to make the light waterproof, the light claims to be shockproof and is very strongly built, we really think it will resist drops and impacts without a problem. The pocket clip is long and very strong, can be used to clip the light to a shirt pocket or a pants pocket without a problem, it has good tension and will not break. Attached to the clip is a small attachment point in case you want to use the light in your keychain. The output is about 20 lumen for up to 1.5 hours of runtime, the beam is very strong and useful for a light of its size, great to inspect places, find missing objects and the normal things you can do with a keychain light. 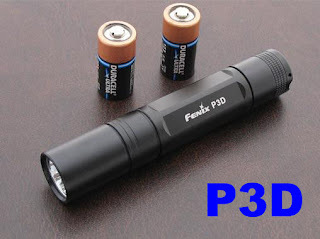 Since the light is small and uses only one AAA battery it is in our opinion more a keychain light than a penlight and if you are looking for a strong hotspot portable mini searchlight this is probably a very good idea. You can order from LightHound for $16.